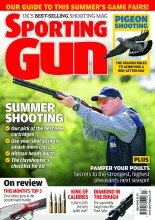 Supermarkets stopped my pigeon shooting! It happened to me last week with a chap who grows lettuce – and they are being absolutely battered to death by wood pigeon. What a waste of food – and a worry for shooting if buyers can make demands of this sort. I certainly have, in fact a few years ago a farmer stopped me shooting on peas that were nearly ripe for vining because the lead shot was coming through the machine and ending up amongst the harvested peas. In this age of civil lawsuits, you can only imagine what would happen if a housewife found some spent pellets in her plate of peas. There is no way of sieving out these pellets from the crop, so I think the farmer is fully justified in not wanting to take the risk, frustrating though it may be for you.